The 31A00-8 Indoor/Outdoor Temperature Sensor from HAI is used for sensing indoor or outdoor temperature from -40 F to 120 F (-40ºC to 50ºC). It is coated with a sealant to withstand outdoor moisture and features a new, high accuracy temperature sensor that doesn't need calibration. 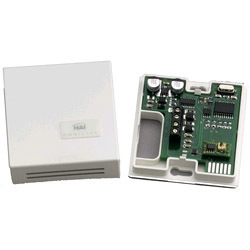 The Model 31A00-8 also includes a Humidity Sensor that is used for reporting the outdoor or indoor relative humidity from 0 to 100 percent. High and low humidity limits can be set for taking action (i.e. turning on the bathroom vent fan, running a/c in de-humidification mode, turning on humidifier in heating mode, etc.) or reporting high or low humidity conditions in homes, greenhouses, wine cellars, coolers, humidors, etc. Controlling humidity is particularly helpful in combating the growth of mold in vulnerable areas of the home, such as bathrooms, basements, attics, etc.